Halloween is just around the corner, which means the average shopper is confronted with overflowing bins of candy at every turn. Even the most disciplined eaters can fall victim to a sweet tooth. It sometimes becomes too difficult to ignore. Luckily, there are some healthy alternatives to binging on KitKats and Snickers. There’s no harm indulging in these healthy Halloween treats, especially when the holiday provides the opportunity. Plus, these simple alternatives are good for children and adults alike! 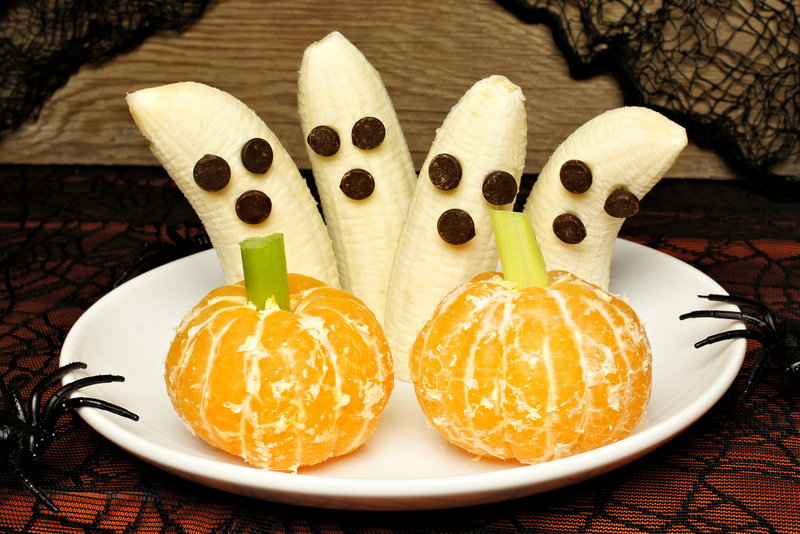 These healthy Halloween treats are adorable and very quick to make. Your ingredients are simple – bananas, white chocolate (enough to melt and cover the bananas), some mini chocolate chips, and popsicle sticks. First, line a baking sheet with wax paper. After you’ve peeled your bananas, cut them in half around the middle, and then split them in half again – this time length-wise. Now, one side should be flat and the other should be round. Insert the popsicle stick into the bottom of the banana. Melt your white chocolate in a saucepan on the stove at low heat. Keep an eye on the temperature – if chocolate gets too hot, it starts to burn and harden. Once it’s melted, hold the popsicle stick and dip the banana into the liquid chocolate. Make sure all sides are evenly coated. Place the chocolate-covered banana on the baking sheet, flat side down. Now, take two mini chocolate chips and place them on the banana as eyes. Repeat this process until you have the desired amount of treats. Then place your baking sheet into the freezer until the chocolate sets firmly. Once they’re frozen, take them out and enjoy your ghostly treat! Store any leftovers in the fridge. 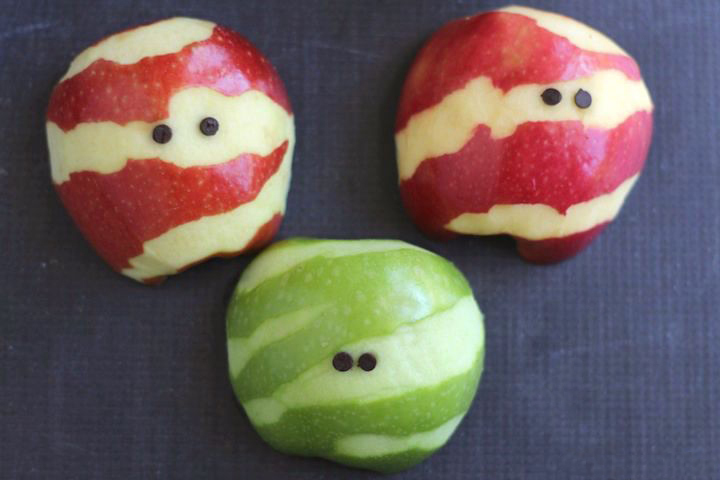 These apple mummies served together with the boo-nanas make quite the Halloween-themed dessert platter for children’s parties – and adult ones too! Cut your apples in half lengthwise, and then carefully remove the core. Then, take a vegetable peeler and, starting at one edge of the apple, peel haphazard strips away. Stagger the peeled sections to achieve the bandaged look. Lay your mummy apple down on a tray, and then add two chocolate chips for eyes, inserting the pointed tip of the chocolate chip in first. As a side note, some apples, like Granny Smith or Gala, have the tendency to brown quickly once exposed to the air. To make sure your apples look good until it’s time for dessert, you may want to choose a type that keeps its color longer, like Honeycrisp or Pink Lady. In addition, you’ll need some chocolate chips for eyes. While the sweetness of Honeycrisp or Pink Lady apples can be a treat on its own, you can also whip up a fast Greek yogurt-based dip to serve with these healthy Halloween treats. For the dip, combine 1 cup nonfat vanilla Greek yogurt, 3 tablespoons packed brown sugar, 1 teaspoon honey, and about ⅛ teaspoon of cinnamon in a bowl. Chill in the freezer for about an hour, and then sprinkle a bit more cinnamon on top before serving. Fall is the time for pumpkin-spiced everything! 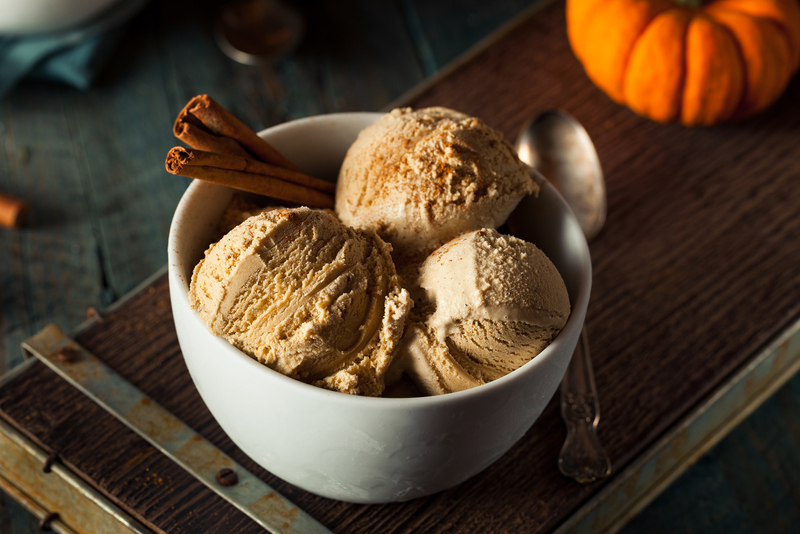 If you enjoy pumpkin-flavored ice cream, but you don’t enjoy all the heavy cream and sugar, this simple recipe for pumpkin ice cream makes a very healthy Halloween treat alternative. Combine 1 cup nonfat Greek vanilla yogurt, 1 cup pumpkin puree, 1 tablespoon granulated sugar, and 1 teaspoon pumpkin pie spice in a bowl until thoroughly mixed. If you have an ice-cream maker, pour the mixture inside and let the machine work its magic. If not, simply place your bowl in the freezer and stir every 30 minutes until you achieve your desired consistency. Autumn is apple-picking season. 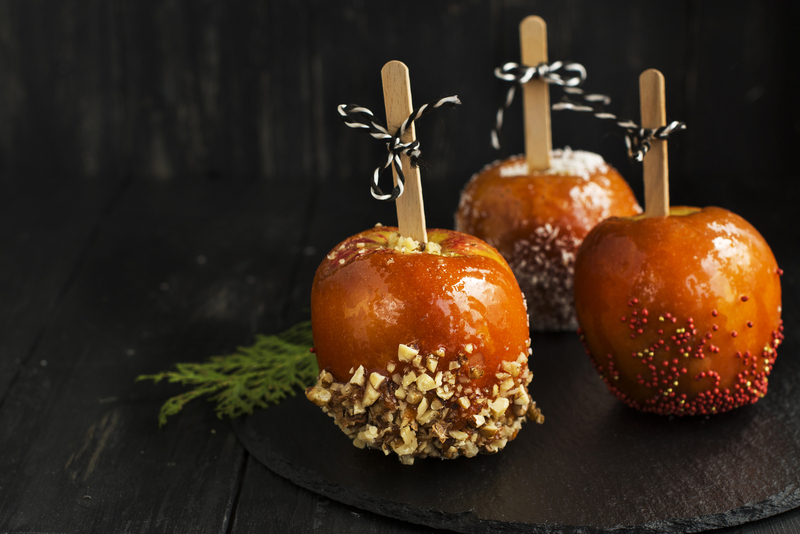 One of the best treats to have around Halloween is candied apples. Candy-coating is a popular choice, but one of the best things about candied apples is they’re totally customizable based on your preferences. If you don’t want all the extra sugar, you can add walnut or almond chunks to the outside, instead of candy or sprinkles, and still enjoy a sweet treat. You can cover them in chocolate (white, milk, or dark), caramel, peanut butter, nuts, chocolate chips, M&Ms, heath bar, or anything you like! They’re fairly simple to make, too. Skewer the center of the apple with a wooden skewer or long popsicle stick, then dip it in your melted chocolate, caramel, etc. Once coated, sprinkle your additional toppings and then freeze until the coating sets. You can get creative and decorate them however you like. Using white chocolate and orange food coloring, you can even make them look like little pumpkins! 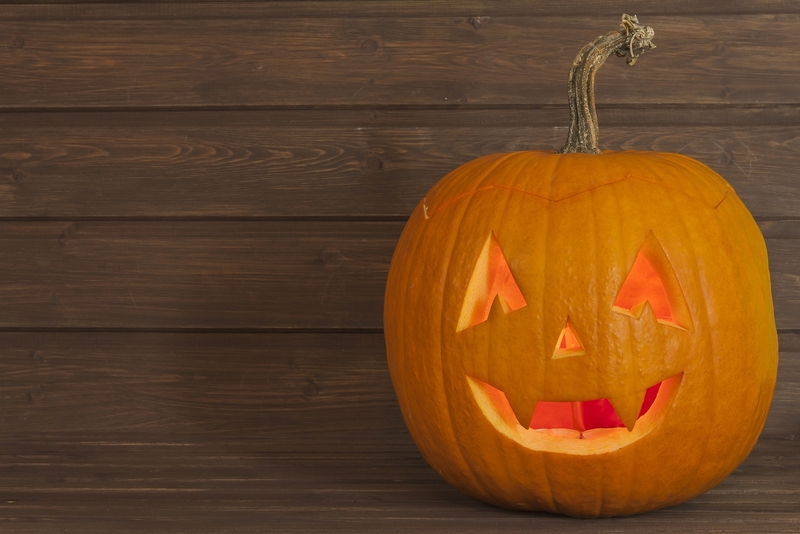 These are just a few examples of some healthy Halloween treats. There are endless possibilities out there for alternative whole-food treats that will satisfy your sweet tooth and ease your health concerns. And, while not all of these treats can be easily packaged and handed out at the front door, they’re ideal for community parties both for kids and adults looking for a healthier Halloween option! Dr. Maita provides an array of services geared towards helping you live to your fullest and best potential. Contact us today to schedule your consultation.